Room size: 1650 square feet. Welcome to the East Austin Chateau in downtown Austin. This 3 bedroom, 2.5 bathroom house is ideal for groups up to 12 that wish to stay downtown in a single property. This house is fully equipped with everything you need to enjoy your stay. Enjoy a full kitchen, on-site parking, a rooftop deck and observatory with amazing downtown views, a covered balcony off of the master suite, and two patios (one front and one back) for lounging outdoors on our lovely Texas nights. Located within walking distance of the 6th Street Entertainment District, the warehouse district, downtown shopping, all of the hip restaurants and bars on the East Side, and UT Stadium, this location is very central on the east side of downtown Austin. You do not need a car unless you want one. Public transportation is also nearby, including the Plaza Saltillo Station for Metro Rail and numerous bus stops throughout the neighborhood. Take advantage of this rare opportunity to enjoy Austin’s downtown skyline and the serene views over the gorgeous Texas State Cemetery. Staying here means that you get to walk to restaurants, coffee shops, live music and more. The outdoor area has been designed to create a peaceful escape right in the middle of town. This is urban living at its finest. There are so many incredible places to eat, drink, and be entertained in Austin that it would be impossible to list it all. From the Chateau, you can easily walk to many great places on the east side of downtown. Grab a slice less than a block away at East Side Pies, or sit down and eat at the Hillside Farmacy. Franklin’s BBQ is just a few blocks, and East End Winery is practically next door. The Austin Public Library and George Washington Carver Museum and Cultural Center are both steps away, along with the Hearts and Robots Hair Salon. If you want to do yoga, pilates, or get a massage, there is a small studio a block from the house. We provide parking in the driveway (which is suitable for 1-2 cars), but there is also plenty of free street parking directly in front of the house. Ryan was a great host and his place is absolutely amazing! We had a great time and with the location it was easy to see all Austin had to offer. Highly recommended!!!! This house was perfect for our group of 13–4 in the double beds in the attic room, 2 in the queen bed in the master, 4 in the double bed and bunk beds in the second bedroom, 2 on the pull-out sofa bed and 1 on the twin-sized air mattress. Everyone loved the cute decor and appreciated the stacks of plastic cups left for us! It was also great to have a full sized fridge and freezer and a fully stocked kitchen, so we were able to make breakfast at home during the weekend. There were also plenty of towels for the group. Ryan’s associate Thomas was also very responsive over text. It was also easy to gain access to the house, as it’s an automated lock with a code, so no need to coordinate to meet-up with Ryan or Thomas. They were very friendly and accommodated our requests for early check-in and late check-out. There are a few eateries within walking distance, but we mostly Uber-ed around the city. Nice house… very accommodating host. Probably one of the best houses you can find for SXSW. Amazing location, with views over most of Austin and a park just in front of the house. The house was amazing with all needed amenities, and the observatory was definitely the best part, enjoying the sunshine with a glass of wine. Had an amazing time. Great house and prime location. Ryan is a great host. Super helpful and always available. Thx again! The east side chateau was home to an incredible weekend and suited the needs of our large group of 12. The house was clean, very well stocked, and ready to go on arrival. Ryan was very helpful and quick to accommodate requests. We would definitely stay with Ryan again as he made the whole process very pleasant and simple. Great house in an amazing neighborhood! Ryan was really helpful throughout the whole process. We had a group of 10 staying here this past weekend and had a great experience. This house in Austin was perfect for our weekend. In the best neighborhood because you can actually walk to many of the cool spots. Communication with Ryan was easy as well as the check-in/check-out. For future guests, I will describe the house in detail as this was not very clear to me when I rented it. The house has 3 floors. The ground floor has a large kitchen, living room with sofa bed and a toilet. The second floor has two rooms: one for 2 people and another one for 4 with a double bed and two bunk beds. The third floor has a room with two double beds. I would say this house is comfortable for 8 people specially because of there are only 2 full bathrooms. One of bathrooms inside double room which makes it harder to access for the rest of the people. I guess this is a normal house layout but with big groups it gets complicated. Anyway, in general this is a great property and I can recommended for your next trip to Austin. Great host, responsive and well stocked house. Loved it! I chose this house for a bachelorette party and it worked out perfectly. Great location, with fun restaurants and stores very close by, and a short uber to downtown. The place was very cute and my friends and I enjoyed our time here! The house was perfect for our group. We did a little bit of extra cleaning when we arrived and they had people mowing the lawn which was nice to have done since it was overgrown. We had one little issue with warm water but they had someone come fix it immediately, which was nice. All in all, the house is great for a large group and the hosts/prop manager was very responsive. We would stay again. What a great place! Roomy enough for our group of 9 on a bachelor party weekend, though two beds had to be shared, with a spacious kitchen and dining room. The location was within walking distance from many great restaurants and bars while also feeling secluded and quiet enough for our group to enjoy the house for its own charm. Only a $10-15 Uber from the Airport while also being under $10 from the bars on Rainey and 6th Streets. Our hosts were very hands off once we arrived in Austin which was great, but assuredly would be as involved as needed. Would definitely recommend this place for any group of 5+ if they’re visiting Austin. The East Side Chateau was great for our group of 6! The host was very accomodating, and the house was perfectly represented in the listing. Our group loved the neighborhood, as it was within walking distance to some outstanding restaurants and bars. The deck and rooftop offered amazing views of downtown Austin. Great location and enjoyed our stay! We were the first travelers to stay in Ryan’s East Side Chateau and just as his other properties this one did not disappoint!!! 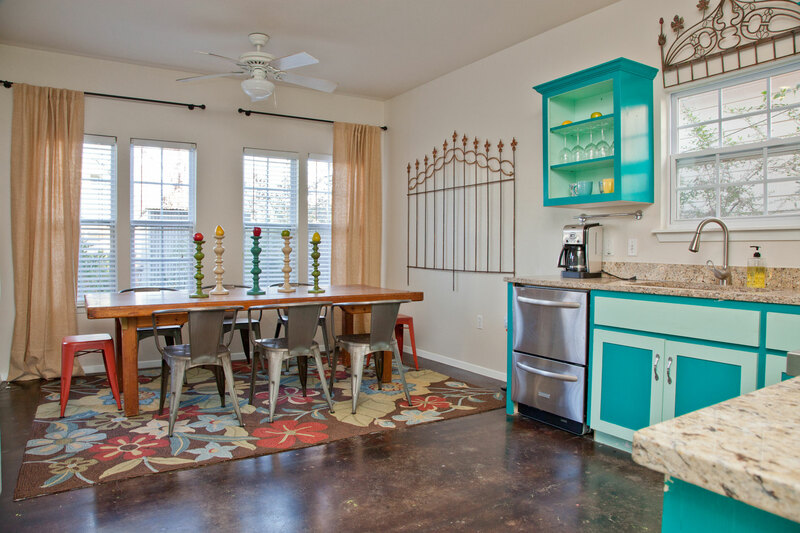 This house comfortably held my group of business travelers and gave us great access to both downtown and east Austin. As mentioned in the description, the East Side Chateau has an observatory on the roof which gives travelers an amazing 360 degree view of Austin. I definitely recommend this property to anyone looking to stay close to downtown Austin with a large group and/or families. The East Side Chateau and Observatory met our needs and expectations for a 3 day bachelor party weekend in Austin, with 8 people in the house. The neighborhood is pleasant and mellow, just up 11th street from Hillside Farmacy, and a very short walk to 6th Street bars and restaurants. Host Ryan was very responsive to all my emails before we arrived, and questions when I was there. Only improvement would be to have clearer instructions about how TV works (had trouble finding channels on downstairs tv, and getting wireless access, as Ryan was a character off on PW, which we eventually figured out). TV and internet were not the point of our trip — we had a very comfortable resting place and launching pad for all the fun we wanted in Austin. Worked out very well. Great place to stay in a nice neighborhood. Quick drive to downtown. Nice and clean. The overall experience was great! We had a group stay here over a long weekend for a wedding. The space was nice and clean, good location, and plenty of coffee shops, food trucks, and restaurants within walking distance. The host was very responsive beginning to end. Jackpot. We could hardly wait for the sun to set so we could get up to the observation deck. It was a pity that we didn’t take advantage of the awesome kitchen, but with all the great restaurants close by. One of us went to Franklin’s to stand in line at 9:30, called us when he was close to the ramp. We walked over and were eating at 12:30. So, thanks and thanks again. I hope we get back sooner than next year. Ryan’s property was exactly as advertised. Very reasonably priced, in an awesome neighborhood, with an amazing view and easy access to downtown. We loved spending time on the rooftop observatory. Everything was smooth start to finish. Five stars. We had a quick stay and did not meet Ryan in person but it was a great fit for us as a group of 7 (one person slept on the pull out couch, everyone else on their own beds). Description was accurate. Good bars and food trucks just a couple blocks south! The house was perfect for our group of 8 girls. The kitchen area was super cute and the house seriously had everything we could possibly need. The location was great! We could walk to some yummy food and the cab ride into town was super cheap. Ryan was so cool. Super easy to chat with and if I needed anything I could easily just text him. Ryan was great and the house was exactly what we were looking for! Very spacious comfortable and a close walk to a bunch of great restaurants and food trucks. Great house and great location. Great experience staying at Ryan’s! Came here with 6 girls for my bachelorette party and there was more than enough space for us. Location is excellent and house is exactly as pictured. Would definitely recommend. We had a great stay at Ryan’s home. It was clean and spacious. Ryan was very responsive and accommodating to our late arrival and checkout times. The house is located in a great neighborhood a short drive (or a long walk) to the many restaurants, bars, parks, etc. Really enjoyed the roof-deck view of the skyline as well. Was able to get in touch with the communicative and responsive Ryan with a fairly last minute booking. We cancelled our hotel reservations and booked this house instead, less than 24 hours before our arrival time. Our group was happy that we made that choice. The place looks exactly like the pictures he has posted, even accents and home fixtures are exactly the same. We had a tremendously smooth and comfortable stay since the location is very central, and all the basics like towels and toiletries were covered. Thanks for hosting us! The location and house were great! You are able to walk to several restaurants and food trucks. Easy access to highway and Congress Ave. We had an issue upon arrival but host was great with getting it handled. Would defiantly look to rent again. I had a wonderful time staying at the East Side Chateau. The house was very clean and the decor was fun and unique (true to pictures!). I loved how easy it was to check in and out of the home. They allowed me to check in early upon my arrival, which was very much appreciated. It was a great house to stay at in Austin and it fit 8 women comfortably! We had a great experience at the East Side Chateau. The location was great. We were able to check-in early. We were in Austin for a Bachelor Party. There are a couple local restaurants/bars within walking distance which we took full advantage of. The 3rd floor patio was great, with an awesome view. The house was clean and exactly how it was portrayed on the website. Great house in a great location! Our group slept very comfortably and had more than enough room (7 of us). Easy walking distance to great restaurants and bars, would recommend for anyone looking for a nice, comfortable and convenient place in Austin. Great host! Great space with great location! We really enjoyed the house. Our team of 9 people was in town for a conference at the downtown convention center and we didn’t want to book hotels that would be far more expensive. The space was a $7 uber ride downtown and worked perfectly as a home base. The house itself was clean and easy to use. The beds were comfortable and while we had to all take turns with the bathrooms, it wasn’t a problem. The location is walking distance to a bunch of great local restaurants and bars, since you’re pretty close to the UT neighborhood. The house itself is located on a quiet street next to a cemetery, so while you’re close to lots of stuff, it was a great quiet place to relax. Ryan was extremely helpful as a host. He responded immediately to any questions we had and replaced an air mattress that wasn’t working within two hours. The directions he gave us for getting in the house and using it were clear and easy to use and the house was in good condition. We’d highly recommend staying here if you’re with a group in town for a conference or event in Austin. Between the location, Ryan’s general awesomeness, and the house being in good condition, the experience was great. Next time we’re in town for the conference, we’ll definitely plan to stay here. Ryan’s house was perfect for our group of seven! The listing was accurate, the house was clean, and the keyless entry made it easy for us to come and go. What really makes this house unique is the rooftop observatory, which provides a great view of the city. It is walking distance to plenty of restaurants and nightlife. I would not hesitate to stay here again on a future trip to Austin! Put together a bachelor party of 12. Ryan was helpful in working with us and providing different options that would accommodate us while keeping us close to downtown. It’s a bit of a walk to the main downtown of E. 6th St. but is only a cheap uber ride to the hot spots. The house was nice and in a quiet area. As long as your company doesn’t mind sharing beds then you’ll be more than happy with everything. Ryan and Thomas were very helpful in their recommendations and details to our group since we’re all out-of-towners. Thanks for your help Ryan. It was a successful bachelor party and trip to Austin. The welcome e-mail was very helpful before our return and entry into and out of the house was seamless! The house is wonderful and in a great location; it was easy to walk to a lot of places in East Austin. The house very comfortably fit 9 people (everyone had a bed) and the kitchen had a lot of useful gadgets that were great. It was clean when we got there and all of the outdoor spaces were great-it was just too cold to enjoy them fully when we were there. The parking in the driveway worked out well and there is amble street parking (we had two cars). Our group had a great time and would recommend staying there again. I love this house! We had 10 people come visit and it worked out perfectly. Love the views that we get from the balcony as well! We loved our stay at East Side Chateau! I rented it for a girls weekend and it was exactly as we expected. 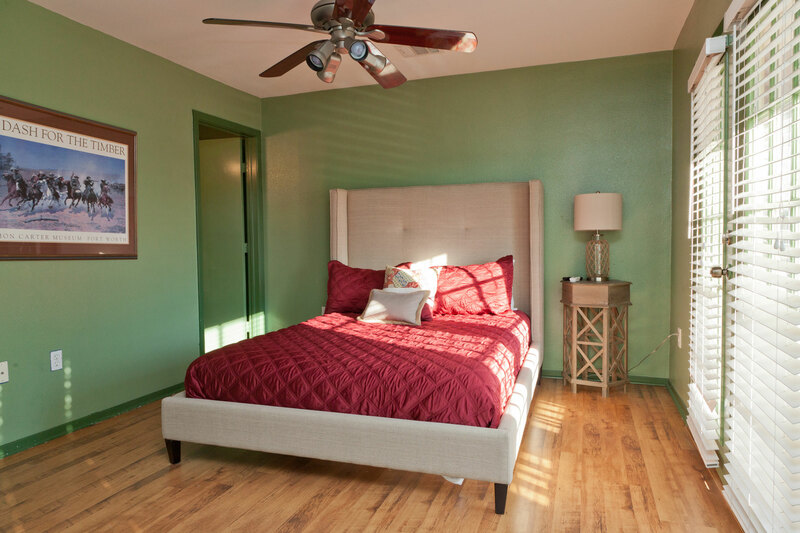 The house was very clean and comfortable and came equipped with everything we needed. It was a fantastic location, never more than a few minute ride anywhere we needed to go. Ryan was a wonderful host, very helpful from the beginning. I would definitely recommend staying here. And the view from the roof top observatory makes it worth every penny! The house is extremely close to all of the action in downtown Austin. 6th street is just a short walk away and can save money on Cabs/Ubers. Beds and amenities were of good quality and comfortable. Franklin’s BBQ is a short walk away, be sure to get there early, and bring some tailgating gear! Definitely worth checking out. Perfect for our Bachelor weekend! Ryan was a great host. He sent a thorough email with instructions on how to access the home and it was in great condition when we arrived. The neighborhood was amazing – just steps away from a great coffee house and a couple restaurants and a few blocks away from the East 6th Avenue with more bars and nightlife. Good property for the price and the hosts were wonderful. There are a lot of beds and the location is great, but zero amenities and the cleaning crew did not do a very good job. The rooftop patio had old used cigars and open stale beers on it. The sheets also had hairs in them. The backyard was not manicured at all – it was practically a jungle so we could not sit out there and enjoy the space. There is limited patio seating as well. That being said, the house is in a good location, has a lot of space and the customer service from the owners and managers was very good. I think the house is a good place to stay, it’s just is not 5 stars in my opinion. All great — great communication, good neighborhood (close to good stuff but still nice and quiet), and large and spacious.